Alternative Sources of NK Cells for Adoptive Transfer – Is Cord Blood the Answer? Natural killer (NK) cell-mediated cytotoxicity contributes to the innate immune response against various malignancies, including leukemia (1, 2). The antitumor effect of NK cells is a subject of intense investigation in the field of cancer immunotherapy. 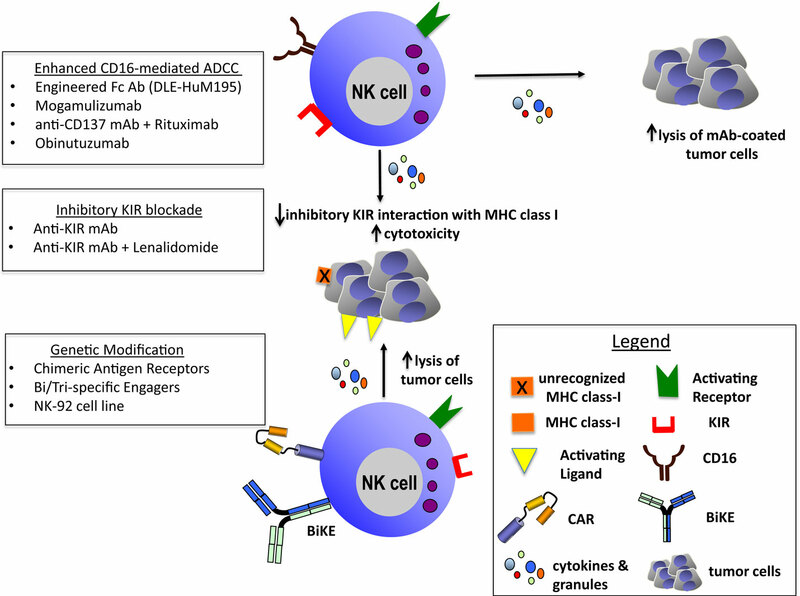 In this review, we will focus on recent advances in NK cell immunotherapy, including augmentation of antibody-dependent cytotoxicity, manipulation of receptor-mediated activation, and adoptive immunotherapy with ex vivo-expanded, chimeric antigen receptor (CAR)-engineered, or engager-modified NK cells. Several cytokines are also known to inhibit NK cell activation and function, thus playing a crucial role in tumor escape from NK immune surveillance. Recently, considerable attention has been paid to the inhibitory effects of transforming growth factor-beta (TGF-β) and IL-10 on NK cell cytotoxicity (12, 25, 26). Several groups have shown that secretion of TGF-β by tumor cells results in downregulation of activating receptors, such as NKp30 and NKG2D, with resultant NK dysfunction (25, 26). Similarly, IL-10 production by acute myeloid leukemia (AML) blasts induces upregulation of NKG2A with significant impairment in NK function (3). The early studies of adoptive NK cell therapy focused on enhancing the antitumor activity of endogenous NK cells (43). Initial trials of adoptive NK therapy in the autologous setting involved using CD56 beads to select NK cells from a leukapheresis product and subsequently infusing the bead-selected autologous NK cells into patients (43, 44). Infusions were followed by administration of systemic cytokines (most commonly IL-2) to provide additional in vivo stimulation and support their expansion. This strategy met with limited success due to a combination of factors (44). Although cytokine stimulation promoted NK cell activation and resulted in greater cytotoxicity against malignant targets in vitro, only limited in vivo antitumor activity was observed (43–45). Similar findings were observed when autologous NK cells and systemic IL-2 were given as consolidation treatment to patients with lymphoma who underwent autologous BMT (46). The poor clinical outcomes observed with adoptive transfer of ex vivo activated autologous NK cells followed by systemic IL-2 were attributed to three factors: (1) development of severe life-threatening side effects, such as vascular leak syndrome as a result of IL-2 therapy; (2) IL-2-induced expansion of regulatory T cells known to directly inhibit NK cell function and induce activation-induced cell death (47–49); and (3) lack of antitumor effect related to the inhibition of autologous NK cells by self-HLA molecules. Strategies to overcome this autologous “checkpoint,” thus redirecting autologous NK cells to target and kill leukemic blasts are the subject of intense investigation (33–35). These include the use of anti-KIR Abs (such as the aforementioned lirilumab) to block the interaction of inhibitory receptors on the surface of NK cells with their cognate HLA class I ligand. Natural killer cell-based immunotherapies are also a promising therapeutic option for solid tumors. A number of studies have shown that the presence of intratumoral NK cells correlates with delayed tumor progression and improved outcomes (53–55). However, the successful application of NK cell-based therapies in the solid tumor setting poses a special challenge. In addition to the immune evasion strategies common to hematologic malignancies, such as secretion of immunosuppressive cytokines and downregulation of activating ligands (55–57), additional challenges specific to solid tumors exist; NK cells must not only traffic to sites of disease, but also penetrate the tumor capsule in order to exert their effector function. Furthermore, tumor targets must be inherently susceptible to NK-mediated cytotoxicity (58). Several groups have focused on strategies to alter the tumor microenvironment by targeting myeloid-derived suppressor cells or regulatory T cells (Treg) rather than the tumors themselves (58, 59). In fact, the prospect of combining NK cell-based immunotherapy with approaches to target the immunosuppressive tumor microenvironment or immune checkpoints, such as KIR blockade, is especially relevant to the treatment of solid tumors (55, 58). Several early phase clinical trials have demonstrated the feasibility of adoptive therapy with autologous or allogeneic ex vivo activated/expanded NK cells in patients with refractory solid malignancies [NCT01875601 (60)]; however, outside of the post-HSCT setting (namely in neuroblastoma), limited data on the clinical efficacy of NK cells in eradicating solid tumors exist. Currently, several trials are actively recruiting patients with refractory solid tumors for adoptive NK therapy (including NCT01807468, NCT02130869, and NCT0210089). Recent approaches to adoptive NK therapy focused on infusion of NK cells that have undergone a process of ex vivo cytokine activation and expansion (61). A number of cytokines (IL-2, IL-12, IL-15, IL-18, IL-21, and type I IFNs) have been studied to activate and expand NK cells ex vivo (62–65). The most extensively studied cytokine is IL-2 (62, 63). This is not surprising, considering IL-2 was the only cytokine available in clinical grade until recently. Nevertheless, NK cells expanded in the presence of IL-12, IL-15, and IL-18, either alone or in combination, have shown remarkable activity against tumor targets in experimental models and offer an attractive strategy for clinical expansion of NK cells (64, 65). IL-15, in particular, is appealing as it does not stimulate Tregs (65). IL-15 has been tested in preclinical models with promising results; however, very high doses were necessary to observe any meaningful in vivo antitumor effects, and toxicity of systemic cytokine administration and cytokine-induced NK-cell apoptosis remained major issues (65). Recently, Miller et al. compared the persistence and in vivo efficacy of adoptively infused freshly activated NK cells (FA-NK) and ex vivo-expanded NK cells (Ex-NK) in a xenotransplantation model. They showed that in vivo NK cell persistence is cytokine dependent, with IL-15 being superior to IL-2. They also reported that cryopreservation of FA-NK or Ex-NK was detrimental to NK cell function, and that culture conditions influence homing, persistence, and expansion of NK cells in vivo (66). Although the results from the abovementioned trials proved that transient persistence of adoptively transferred NK cells obtained via apheresis is feasible and safe, the requirement of a willing, available donor precludes the widespread applicability of this approach. Hence, more recent efforts have focused on optimizing methods for ex vivo expansion of NK cells from peripheral blood mononuclear cells (PBMCs) collected by a simple blood draw, with a goal of producing large quantities of purified, functionally active NK cells for clinical use. These expansion strategies include the use of “feeder cells,” such as monocytes in the form of irradiated PBMCs, EBV-transformed lymphoblastoid cell lines (EBV-LCLs) or gene-modified, irradiated K562 cells expressing membrane-bound IL-15 or IL-21 and 41BB ligand for costimulation (61, 66–69) in gas-permeable large-scale expansion flasks. These techniques have dramatically increased the yield and activation status of NK cells, potentially overcoming the need for leukapheresis. Because the feeder cells used in these manufacture methods are lethally irradiated prior to use in culture (leaving the remaining feeder cells to be lysed by the expanding NK cells), the risk of infusing viable feeder cells is negligible. However, a number of safeguards have also been incorporated that include monitoring the growth rate of feeder cells and testing for the presence of viable feeder cells at the end of the culture period. Clinical products are, therefore, only released if no viable gene-modified K562 cells or transformed LCLs are present, with strict cutoff values for contaminating B cells and monocytes at the end of the culture period as well (67). Although these expansion methods can produce large numbers of functionally active NK cells, concomitant expansion of competing cells with immunosuppressive properties, such as Tregs remains problematic. Early studies reported that NK cell infusions from haploidentical donors are able to induce remissions in some patients with AML, but not others (50–52). Several groups, therefore, set out to explore factors that may contribute to the failure of NK expansion in vivo. Bachanova explored the effect of competition between Tregs and NK cells in 57 patients with refractory AML who received lymphodepleting chemotherapy followed by NK cell infusion and IL-2 administration [NCT00274846 and NCT01106950 (70)]. Fifteen patients also received the IL-2-diphtheria toxin fusion protein (IL2DT) to deplete Tregs prior to NK cell infusion. IL2DT treatment was associated with increased donor NK cell persistence and improved CR and disease-free survival at 6 months (33 vs. 5% in patients not receiving IL2DT; P < 0.01). In the IL2DT cohort, NK cell expansion correlated with higher post-chemotherapy serum IL-15 levels (P = 0.002) and effective peripheral blood (PB) Treg depletion (<5%) at day 7 (P < 0.01). This study shed light on the importance of optimizing the cytokine milieu to facilitate the in vivo expansion of adoptively transferred NK cells and identifying ways to abrogate the immunosuppressive elements, such as regulatory T cells. Although these data are encouraging, adoptive transfer of NK cells under good manufacturing practices (GMP) requires significant infrastructure and specialized processing equipment, thus limiting the availability and scalability of these NK cell therapies to a few specialized institutions (61). Nonetheless, the feasibility of centralized processing and safe delivery of ex vivo-manufactured NK cells for infusion at remote clinics have been demonstrated, suggesting that the practice might become more widespread as procedures are optimized (71). For example, in order to improve access to ex vivo activated NK cells and ease the burden associated with producing cellular products at individual treatment centers, the National Heart, Lung, and Blood Institute (NHLBI, Bethesda, MD, USA) sponsored the Production Assistance for Cellular Therapies (PACT) program. Using this approach, activated NK cells have been sent to other centers for infusion into patients (72, 73). Since the initial reports of successful adoptive transfer of NK cells (50–52), many groups continue to perform extensive preclinical exploration of the ideal manufacturing strategy for ex vivo activation and expansion of NK cells. Several expansion methods optimized in the preclinical setting have been successfully scaled up for the clinic (61, 67–70). In addition to the six clinical trials of adoptive NK cell therapy for leukemia that have reported their data (48–52, 70), there are currently 12 active clinical trials enrolling patients with hematologic malignancies for NK cell adoptive therapy, a number that is steadily rising. Although the majority of clinical studies of NK cell immunotherapy have used PB NK cells, several alternative sources of NK cells exist. These include bone marrow, human embryonic stem cells (hESCs), induced pluripotent stem cells [iPCSs (74, 75)], and umbilical cord blood (CB). While the generation of NK cells from hESCs or iPCS has been largely experimental to date, clinical-grade generation and expansion of NK cells from CB-derived CD34+ cells has been successfully achieved (76). Umbilical CB as a source for NK cells lends additional clinical advantages. CB contains a high percentage of NK cells (77, 78) and serves as an immediate “off-the-shelf” source of NK cells, with less stringent requirements for HLA matching, and lower risk of causing GVHD following infusion due to the naivety of the cord T cell repertoire (77, 78). Although no direct comparison of PB- and CB-derived NKs has been performed in the clinical setting, in vitro studies have identified a number of differences between CB and PB NK cells. CB NK cells form weaker conjugates with target cells due to the lower membrane expression of adhesion molecules on their surface (79, 80). CB NK cells also express higher levels of lectin-like inhibitory receptors (CD94/NKG2A) and lower levels of KIRs, indicating an immature phenotype (81). CB NK cells are similarly sensitive to cytokines for in vivo expansion and persistence (82). However, it appears that the requirements for in vitro expansion of CB NK cells may be different to those required for PB NKs. CB NKs are less responsive to IL-2 stimulation, which may be related to the lower expression of IL-2Rα and reduced activation of the STAT5 signaling pathway as compared with PB NK cells (83). The combination of IL-15 and IL-18, however, can induce significant proliferation and cytokine production by CB NK cells, while the killing capacity of CB NK cells is significantly enhanced after stimulation with IL-15 (83). As with PB-derived NK cells, T-cell contamination is a concern, but can be ameliorated by CD3 depletion. T-cell contamination should be limited to <1–5 × 105/kg (61) to minimize the risk of GVHD. In addition, CD56+ selection reduces B-cell contamination to <1%, which minimizes passenger B lymphocyte-mediated complications, such as EBV-related post-transplant lymphoproliferative disorder (PTLD) and acute hemolytic anemia. More recently, efforts have focused on optimizing the large-scale expansion of purified CB-derived NK cells. Shah et al. were the first to describe a strategy for expanding NK cells from cryopreserved CB units in which they employed K562-based artificial antigen-presenting cells (aAPCs) expressing membrane-bound IL-21 (clone 9.mbIL21) (77, 84). The clone 9.mbIL21 cell line is GMP-grade and expresses membrane-bound IL-21, 4-1BB ligand, CD64 (FcγRI), and CD86. After only 14 days of culture in a gas-permeable culture system, mean-fold expansion of CB-NK cells was 1848-fold from fresh and 2389-fold from cryopreserved CB with >95% purity for CD56+CD3− NK cells. aAPC-expanded CB-NK cells displayed a phenotype similar to that of expanded PB-NK cells and maintained strong expression of the transcription factors eomesodermin and T-bet. Furthermore, CB-NK cells formed functional immune synapses and efficiently killed various MM targets in vitro. Finally, aAPC-expanded CB-NK cells showed significant in vivo activity against MM in a xenogenic mouse model. These findings highlight a clinically applicable strategy for the generation of highly functional CB-NK cells using an aAPC platform, which can be potentially extended to other hematologic malignancies and solid tumors (77). A number of phase I/II clinical trials are underway to test the feasibility and efficacy of CB-NK cell adoptive therapy in patients with hematologic malignancies (NCT01619761, NCT01729091 NCT02280525, NCT01914263, and NCT00412360) (summarized in Table 1). Table 1. Published results of NK adoptive immunotherapy trials in hematologic malignancies. The adoptive transfer of NK cell lines has several theoretical advantages over the use of patient- or donor-derived NK cells. These are primarily related to the lack of expression of iKIRs, presumed lack of immunogenicity, ease of expansion and availability as an “off-the-shelf” product (85). Several human NK cell lines, such as NK-92 and KHYG-1, have been documented to exert antitumor activity in both preclinical and clinical settings (86–88). NK-92, the most extensively characterized NK-cell line, was established in 1994 from the PB of a male Caucasian patient with NHL. NK-92 cells are IL-2-dependent, harbor a CD2+CD56+CD57+ phenotype and exert potent in vitro cytotoxicity (86). Infusion of up to 1010 cells/m2 NK-92 cells into patients with advanced lung cancer and other advanced malignancies was well tolerated and the cells persisted for a minimum of 48 h with encouraging clinical responses (86, 88–91). However, potential limitations of using NK cell lines, such as NK-92 cells, include the requirement for irradiation to reduce the risk of engrafting cells with potential in vivo tumorigenicity, and the need for pre-infusion conditioning to avoid host rejection. Furthermore, infusion of allogeneic NK cell lines may induce T and B cell alloimmune responses, limiting their in vivo persistence and precluding multiple infusions. A number of studies are testing NK-92 cells (Neukoplast®) in patients with solid tumors, such as Merkel cell cancer and renal cell carcinoma, as well as in hematological malignancies (85). Chimeric antigen receptors have been used extensively to redirect the specificity of T cells against leukemia (94). Recently, use of an anti-CD19-BB-ζ receptor transduced into autologous or allogeneic T cells produced dramatic clinical responses in patients with acute lymphoblastic leukemia (95, 96); however, infusions of activated T cells from an allogeneic source are likely to increase the risk of GVHD. T cell-depleted allogeneic NK cells, by contrast, should not cause GVHD, as predicted by observations in murine models, as well as in patients with leukemia and solid malignancies treated with haploidentical NK cells (50–52). Given their shorter lifespan and potent cytolytic function, mature NK cells provide attractive candidate effector cells to express CARs and, provide an excellent source of off-the-shelf cellular therapy for patients with cancer. The feasibility of genetically engineering NK cells to express CARs has been shown in the preclinical setting (97, 98). Primary human NK cells, as well as NK-92 cells, have been successfully engineered to express CARs against a number of targets including CD19, CD20, CD244, and HER2 (97). CAR-transduced NK cells mediate efficient in vitro and in vivo killing of tumor targets (97, 98) although to date, no clinical data of CAR NK cell therapy have been reported. Shimasaki et al. recently tested the expression of a receptor containing CD3ζ and 4-1BB signaling molecules (anti-CD19-BB-ζ) in human NK cells after mRNA electroporation using a clinical-grade electroporator. The authors reported adequate transfection efficiency 24 h after electroporation, with median anti-CD19-BB-ζ expression of 40.3% in freshly purified and 61.3% in expanded NK cells. NK cells expressing anti-CD19-BB-ζ secreted IFN-γ in response to CD19-positive target cells. Interestingly, the levels of CAR expression in NK cells after mRNA transfection were comparable to those achieved by retroviral transduction. A large-scale protocol was developed to transfect expanded NK cells, achieving excellent receptor expression and considerable cytotoxicity of CAR-transduced NK cells in xenograft models of B-cell leukemia (99). Another interesting strategy is the development of CAR-modified NK cells that target NKG2D ligands on the surface of tumor cells, rendering NK more cytotoxic against a variety of hematologic and solid malignancies (100). NK cells have also been successfully engineered to target antigens on a variety of solid tumors. For example, an NK-CAR targeting the ganglioside GD2 (present on neuroblastoma cells) has been tested in preclinical studies (101, 102). GD2 is also expressed on breast cancer stem cells, thus raising the potential for its widespread use as a target for immunotherapy (103). Additional antigens targeted by NK CARs include HER2 (overexpressed in a number of solid tumors), CD138, and CS1 (overexpressed in MM) (104, 105). Although these data support the use of CAR engineering to redirect the specificity of NK cells to augment their cytotoxicity, a number of challenges remain. These include the relative difficulty in expressing exogenous genes in primary human NK cells and the need to expand NK cells in culture to achieve adequate numbers for clinical studies of immunotherapy. To counteract this difficulty, some groups have expressed CARs in the human NK-like cell line NK-92, in an attempt to engineer a uniformly cytolytic effector cell population (106). As previously mentioned, NK-92 cells can be easily expanded in culture and their safety has been shown in phase I clinical trials in human subjects. Thus, CAR-expressing NK-92 cells may offer a practical source of cells for NK cell-based immunotherapeutic trials. In order to prevent the risk of engrafting cells with potential in vivo tumorigenicity, however, NK-92 cells must be irradiated prior to infusion, which may in turn significantly impact their in vivo persistence and long-term antitumor efficacy. Although limited in vivo persistence could prove beneficial once the alloreactive NK cells have eradicated the tumors, a number of studies of adoptive therapy with NK cells and CAR-modified T cells have reported the importance of cell persistence in inducing long-term antitumor response (50, 95, 96). When considering the use of CAR-modified effector cells, one must take into account their safety profile. Many of the same concerns raised with CAR-modified T cells may be relevant to CAR-NK cells. These include on-target/off-tumor effects, GVHD, cytokine release syndrome, tumor lysis syndrome, and toxicity to normal tissues due to limited selectivity of the target antigen (107–109). Thus, the necessity of equipping CAR-modified NK cells with a “safety switch” or suicide gene is an important question to explore. While mature allogeneic CAR-engineered NK cells are expected to be short lived, data on the persistence of more immature NK cells, such as those derived from CB, are lacking. Interestingly, a recent study reported that IL15/4-1BBL-activated NK cells infused early after T-depleted allogeneic stem cell transplantation in patients not receiving immunosuppressive prophylaxis could contribute to acute GVHD (110). To this effect, the insertion of a suicide safety switch system, as employed with CAR-modified T cells (111, 112), can provide an efficient means for depletion of these cells if needed. Inducible suicide systems have safely and effectively eradicated GVHD in patients receiving adoptively transferred T cells without causing deleterious effects (112). However, these systems have not been extensively studied in NK cells, and in the absence of clinical data on the in vivo persistence of CAR-modified NK cells, the necessity of a suicide switch in this setting remains unknown. Despite the growing wealth of preclinical experience with CAR-engineered NK cells, to date, only two clinical studies (both targeting CD19+ malignancies using a retroviral transduced anti-CD19-BB-ζ NK-CAR) have obtained regulatory approval: one is a recently completed pediatric study at St. Jude Children’s Research Hospital, where haploidentical NK cells modified with anti-CD19-BB-ζ CAR were infused into patients with B-ALL (ClinicalTrials.gov.NCT00995137) and the other is an ongoing study at the National University Hospital in Singapore (ClinicalTrials.gov.NCT01974479) using IL-2-activated haploidentical CAR-modified NK cells in pediatric and adult patients with refractory B-ALL (99). The results of these studies have not been reported to date. Figure 1. Enhanced CD16-mediated ADCC: engineered Fc Ab (DLE-HuM195) (27), mogamulizumab (30), anti-CD137 mAb + rituximab (36–39), and obinutuzumab (31). Inhibitory KIR blockade: anti-KIRmAb (33–35) and anti-KIR mAb + lenalidomide (35). Genetic modification: chimeric antigen receptors (97–105), bi/trispecific engagers (113, 114), and NK-92 cell line (86–91). Although experience has shown that adoptive immunotherapy with allogeneic NK cells may be more efficacious than with autologous NK cells, to date, their long-term antitumor benefits have been modest (3). Expansion and persistence of NK cells following infusion appear to be the main determinants of clinical response (50–52, 70), thus underscoring the importance of identifying ways to enhance their persistence and antitumor activity. It is likely that the combination of high-dose lymphodepleting chemotherapy with additional modifications (such as Treg depletion, in vivo administration of cytokines, such as IL-15 or enhancement of CD16-mediated antigen targeting) may maximize NK persistence and efficacy. In addition, the possibility of third-party “off-the-shelf” products with partially HLA-matched NK cells from CB, third-party donors, or NK cell lines allow the advantage of unlimited sources of cells to improve the practicality of cell therapy. With increasing focus on genetically modifying NK cells to redirect their specificity or engager-modified NK cells, it is likely that NK cells will move to the forefront of cancer therapy over the next few years. RR and KR wrote and edited the manuscript. The authors’ research efforts are funded in part by the Lymphoma Research Foundation (RHR), Lymphoma SPORE (RHR), MDACC Leukemia SPORE Grant CA (KR), and SINF (KR). 4. Lanier LL, Le AM, Civin CI, Loken MR, Phillips JH. The relationship of CD16 (Leu-11) and Leu-19 (NKH-1) antigen expression on human peripheral blood NK cells and cytotoxic T lymphocytes. J Immunol (1986) 136(12):4480–6. 13. Karre K. Immunology. A perfect mismatch. Science (2002) 295:2029–31. 16. Bradley M, Zeytun A, Rafi-Janajreh A, Nagarkatti PS, Nagarkatti M. Role of spontaneous and interleukin-2-induced natural killer cell activity in the cytotoxicity and rejection of Fas1 and Fas- tumor cells. Blood (1998) 92:4248–55. 18. Kayagaki N, Yamaguchi N, Nakayama M, Takeda K, Akiba H, Tsutsui H, et al. Expression and function of TNF-related apoptosis-inducing ligand on murine activated NK cells. J Immunol (1999) 163:1906–13. 46. Benyunes MC, Higuchi C. Immunotherapy with interleukin 2 with or without lymphokine-activated killer cells after autologous bone marrow transplantation for malignant lymphoma: a feasibility trial. Bone Marrow Transplant (1995) 16(2):283–8. 57. Rouce R, Shaim H, Sekine T, et al. The TGF-β/SMAD pathway is an important mechanism for NK cell immune evasion in childhood B acute lymphoblastic leukemia. Leukemia (in press). 79. Dalle JH, Menezes J, Wagner E, Blagdon M, Champagne J, Champagne MA, et al. Characterization of cord blood natural killer cells: implications for transplantation and neonatal infections. Pediatr Res (2005):57. 86. Klingemann HG, Wong E, Maki GA. cytotoxic NK-cell line (NK-92) for ex vivo purging of leukemia from blood. Biol Blood Marrow Transplant (1996) 2:68–75. 90. Yan Y, Steinherz P, Klingemann HG, Dennig D, Childs BH, McGuirk J, et al. Antileukemia activity of a natural killer cell line against human leukemias. Clin Cancer Res (1998) 4:2859–68. Copyright: © 2015 Rezvani and Rouce. This is an open-access article distributed under the terms of the Creative Commons Attribution License (CC BY). The use, distribution or reproduction in other forums is permitted, provided the original author(s) or licensor are credited and that the original publication in this journal is cited, in accordance with accepted academic practice. No use, distribution or reproduction is permitted which does not comply with these terms.